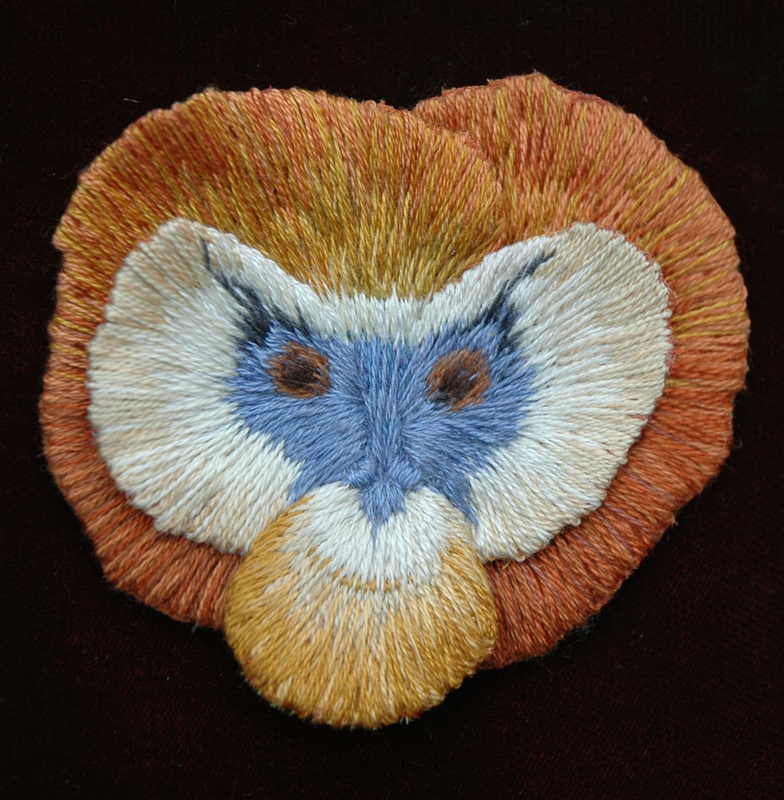 Winter flowering pansies are in the shops now, but I have a set of embroidered pansies in flower all year round…the Pansy Faces from the Flora Embroideries. 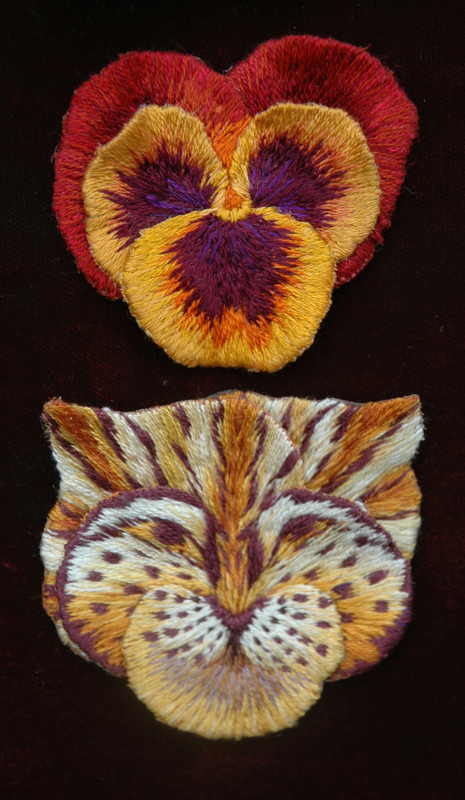 So just how did the rust and gold pansy on the left turn into the tiger below? I will try and show you. Visiting the many different flower shows whilst researching The Flora, I was struck by the way the pansies were displayed – they are arranged separately in trays, not as the usual bunch of flowers in a vase, but just the heads placed poking out of a board on a tray – why? 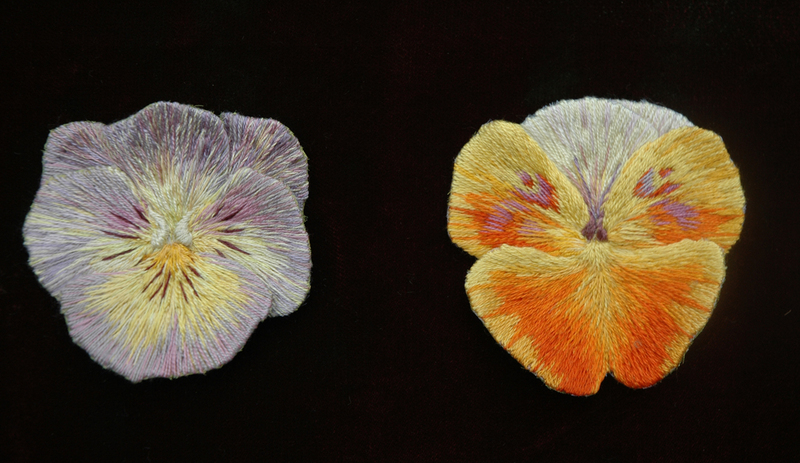 I like to think that it really makes you look carefully at the difference in each wonderful flower head; but I suspect it may be because one of the criteria for a show pansy is to try to grow the petals to form a perfect circle. 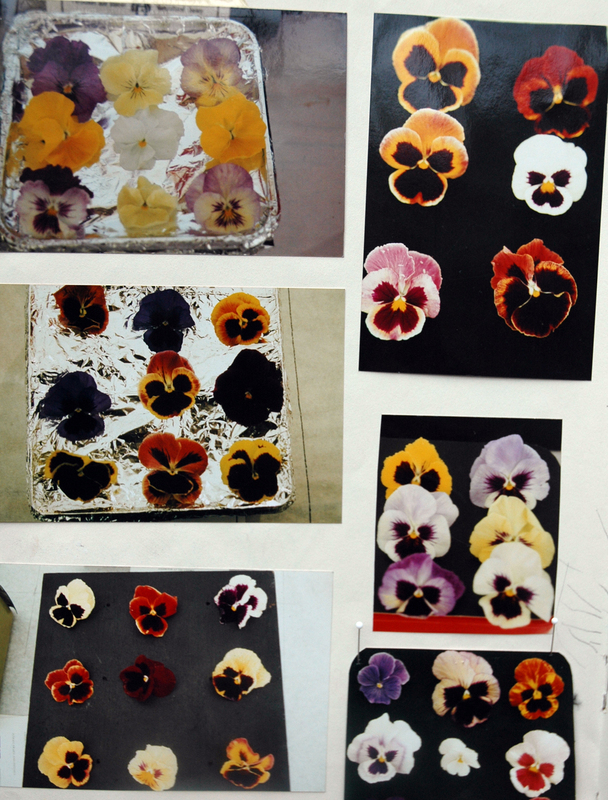 Then “heads” and “pansy faces” came together in my mind, so I started to photograph the trays at all the shows I visited, as you can see below the standard of presentation is often patchy and there seems to be no attempt at colour co-ordination! I fantasised that if I could breed flowers I would develop the pansies further by changing the shapes of the petals and regulating their colours. 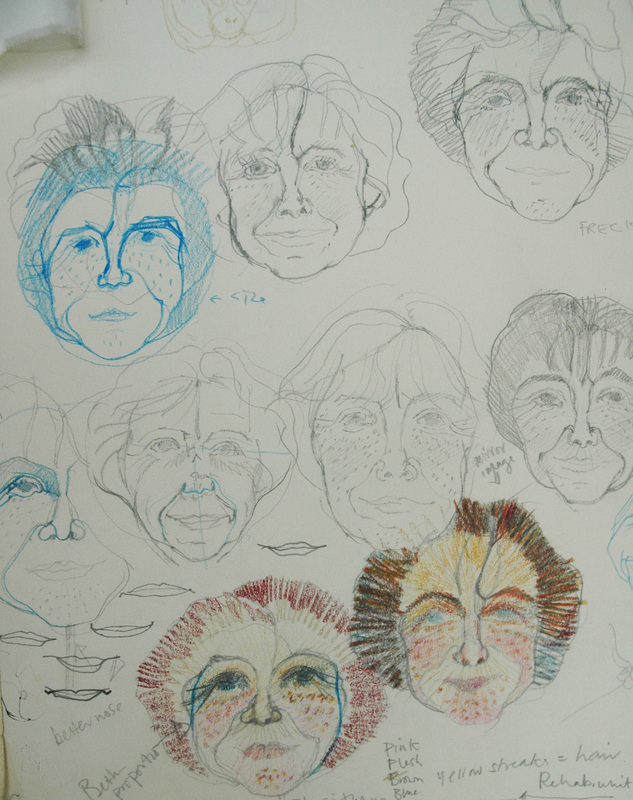 I tried also to keep the changes to a minimum to show the stages of metamorphoses from flower to face. You can see that in the drawing below I started with a butterfly. which was fairly easy, and then moved onto the owl..he was a bit trickier and the problem of making this metamorphosis became apparent – whilst drawing and inventing from the research everything was clear, but whilst stitching the flowers/birds/ animals my mind became confused between whether I was stitching an ear or a petal…..and this got more confusing as I developed the series. 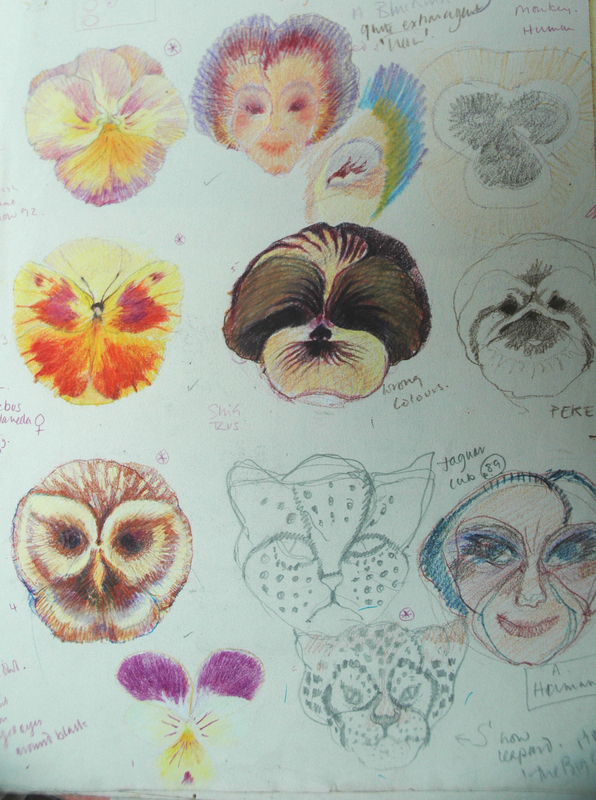 drawing for pansy metamorphosis - it all began so innocently! I then developed the cat or tiger; the stripes were fascinating to depict as they could follow through the growth patterns of the petals and it was a delight to invent and stitch, as was the monkey – the dog was not made – if I could have drawn a wire fox terrier as pansy I would have included him that but I could only manage a shitzu – I have always thought of them as pansy faced dogs. 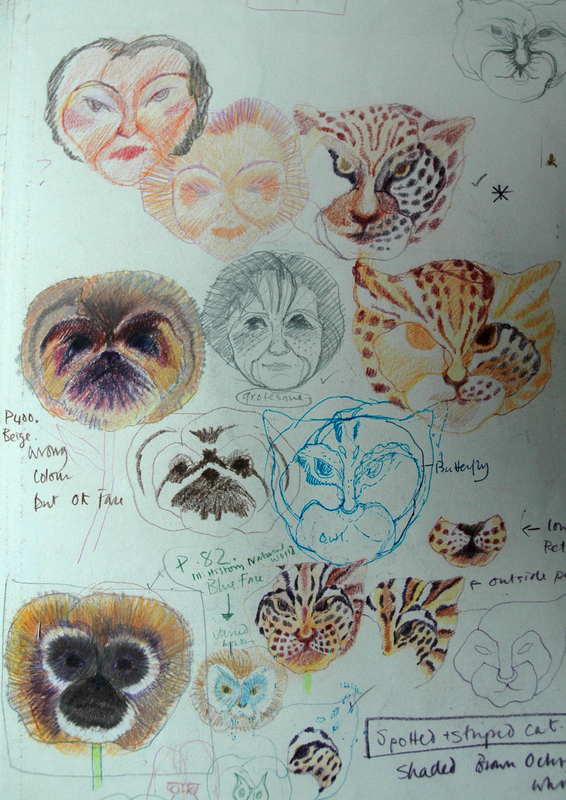 studies for the pansy cat. I then decided that this was all too innocent, while I was happily playing and exercising total control over inert materials – the plant breeders and agricultural scientists were not. What would happen if it all went horribly horribly wrong? The ultimate goal for mankind seems to be to become like god and make make everything for our own benefits and in our own likeness. This was hard decision to make and I knew from the start that I would have to eventually develop a human face; I at first thought it could be a nice face – another beauty like Flora and the Edible Woman. But really all along I had known it had to be a self portrait to make sense of my idea. I first appear drawn in grey pencil amongst my lovely colourful animals and fairy faces – and yes I do recognise that it is a sign of vanity – but I have never ever liked to see pictures of myself. Friends have learned not to show me any photographs they have taken of me – I rip the heads off them – I want only to be known by the images in my work – so a control freak as well…I know I know. my exhibit for the pansy class. As I told you before, all your flowers and veggies have very strong personalities. And now, seing pansies in your works I will now it is an artist herself 🙂 Great! I stumbled across your weblog while searching for Archimboldo’s works. Your embroidery is exquisite! You really do lovely work and you truly have the eye of an artist! Thank you for sharing your work with the world. good to know that people are looking at this work even though it lives in a cupboard in my studio at present. Arcimboldo is fascinating isn’t he – and so influential hundreds of years after his death – have you seen the book The Arcimboldo Effect : Transformations of the Face from the Sixteenth Century to the Twentieth Century, published by Thames and Hudson in England in 1987 ? I love these! Especially the monkey!! Do you sell your work somewhere? 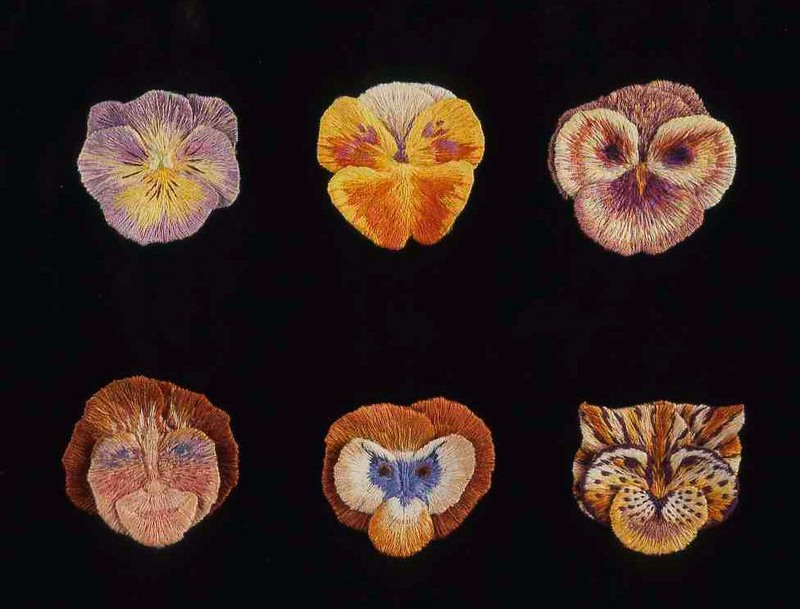 no i don’t generally sell my work, I work to commission most of the time, and this pansy faces work belongs to a set of work I stitched a long time ago and I have kept the whole set of 9 embroideries as they form an exhibition and i did not want to split them up. 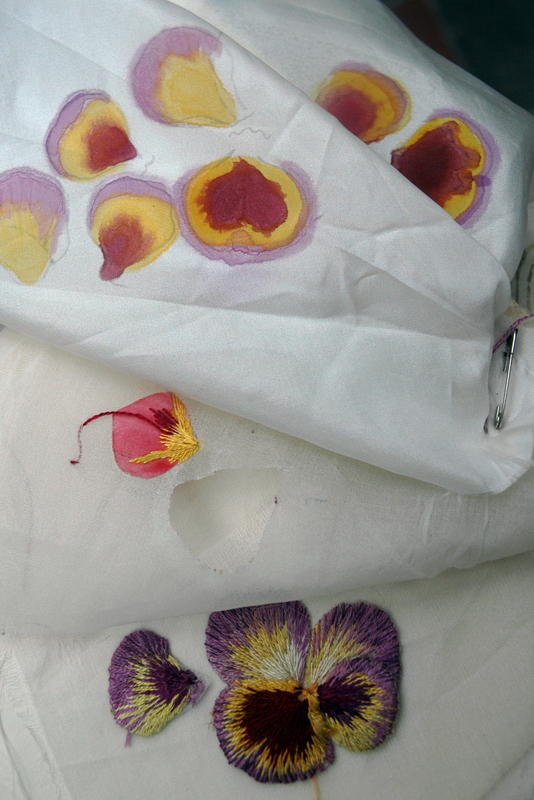 When I have mixed or studio exhibitions I do make work to sell – but have never repeated making the pansies – I did however do several workshops on how to stitch a 3D pansy from a drawing of a real one – the students first have to do the drawing then stitch from the drawing.